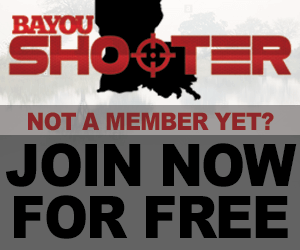 Welcome to the BayouShooter.com Forums. A private section for Law Enforcement Officers. Please click here for access info.. Preparing for the storm, recovering from it, and Fire, EMS, and other emergency services discussions. A place for LEOs & Military to congregate. New archery range in central! ASPs, Stun Guns, Pepper Spray, etc. Baton Rouge (and area) Leather Worker? Post Workouts, Progress, Martial Arts, Crossfit, etc here. In here goes everything that doesn't belong in another section, including land or property. One man's trash is another man's treasure. Give it away here. Post good deals you find on the net that you think others might enjoy. DO NOT post your own ads here. Post feedback about completed transactions. Another Prefix in Classifieds Perhaps? Most users ever online was 8,669, January 4th, 2016 at 10:15 PM.